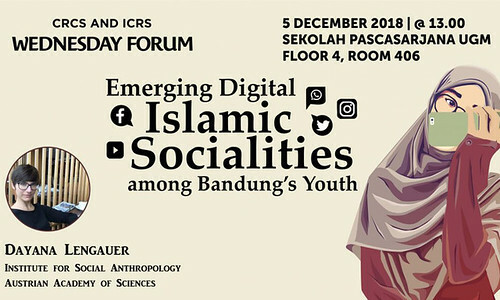 Bandung is home to numerous groups, so called “komunitas”, who effectively seize emerging social spaces evolving from the interplay between urban and technological development and the increased use of social media in all spheres of everyday life, including religious practice. For many of them, social media enable forms of affective awareness and engagement that promote new models of sharing a ‘zeal of piety’ (semangat taqwa) that are appealing and easily adopted by a young and interconnected Muslim generation. Within this context of emerging social media practices and religious socialities, this talk will explore contemporary youth activism and their definitions and experiences of diversity in the context of rising intolerance, both online and offline. Dayana Lengauer is recipient of the Doctoral Fellowship of the Austrian Academy of Sciences at the Institute for Social Anthropology, Austrian Academy of Sciences. Her dissertation project explores youth activism and social media practices related to pluralism in Bandung. She received her Bachelor’s and Master’s Degree in Cultural and Social Anthropology at the University of Vienna, Austria.